Advantage TMS represents a broad line of ultrasonic transducers, and piezo products with both open and closed face construction. Available operating frequencies range from 25 kHz to 320 kHz. Available beam angles range from a narrow 7 degrees to a maximum of 125 degrees. This transducer design produces an excellent receive sensitivity, and a wider bandwidth at high sound pressure level outputs. It remains stable with changes in temperature and humidity, and is also a good choice for CW (continuous wave) mode of operation. Open and closed faced transducers are also made in a pulse transmit configuration. One transducer is used for both transmitting and receiving. This configuration help simplifies the design for echo ranging applications. Other specialized construction transducers include mirror bender configuration, glass filled and silicon rubber faced transducers. New Electrostatic transducers offer exceptional sensitivity and performance when detecting soft less reflective type target such as people, clothing and other porous materials. 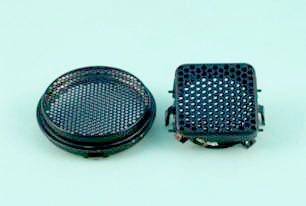 The construction of the transducer is similar to that of a capacitor having two plates, one fixed and one able to flex. Between the two plates is an insulating polyester material with a conductive metalized coating on one side forming the second plate. A modulated high frequency electric potential is applied between the two plates and the flexible plate is attracted to and repelled from the fixed plate at the modulated frequency. This mechanical motion intern generates an ultrasonic acoustic wave pulse in front of the transducer, thus acting like a speaker. 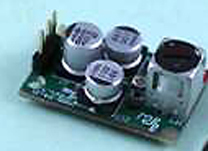 Sonar Ranging Module, Custom Sonar ASIC, and Impedance Matching Transformers have been added to the wide selection of products & services offered by Prowave Electronics and Advantage TMS Inc.
New The highly integrated design of the SRM400 ranging module, featuring the new PW0268 Custom Sonar ASIC, simplifies the process for creating a ranging system. Only three wires are needed to perform this function, ground, power and control. Once initiated through the control input, the module transmits the ultrasonic burst signal to drive the transducer. The control line then reverts to the receive mode, waiting for a returning echo signal from the transducer. The module identifies, amplifies and processes a valid returning echo signal, then drives the control line high. In order to get a range measurement, the user simply measures the elapse time between these two events. Knowing the speed of sound in air (342 m/sec.) this time can be converted into distance. If you do not see what you are looking for please feel free to contact us with your special request. Additional Information is available in PDF format.